Configuring a user to use Autospreader SE and Synthetic SE servers is almost identical to configuring a user to trade on any other TT Gateway. If a trader logs into all TT Gateways with the same TTORD gateway login, you can map the trader's TTORD to Autospreader SE or Synthetic SE. 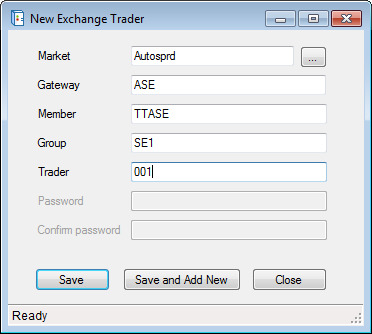 If a trader uses an Exchange Trader gateway login or uses multiple TTORD gateway logins to connect to a set of TT Gateways, you can assign new Autospreader SE or Synthetic SE gateway logins to the trader. This tutorial will show you how to establish an Autospreader SE or Synthetic SE gateway login, and then how to configure a user to connect to the Autospreader SE or Synthetic SE using that gateway login. One procedure describes how to configure a user that has an existing TTORD, and the other procedure describes how to configure a user that does not have an existing TTORD. As an administrator you create Autospreader SE and Synthetic SE gateway logins. You can allow multiple traders to share an order book by assigning gateway logins that have the same Member and Group IDs. Note: Traders who want to share, view, and modify orders working on an Autospreader SE or Synthetic SE Server must log onto the same Autospreader SE or Synthetic SE with the same Member and Group IDs, and log onto the same TT Gateway(s) with the same Member and Group IDs. After you have determined your Autospreader SE and Synthetic SE gateway login naming convention, you can configure a user that either has an existing TTORD or does not have an existing TTORD to connect to the Autospreader SE or Synthetic SE. 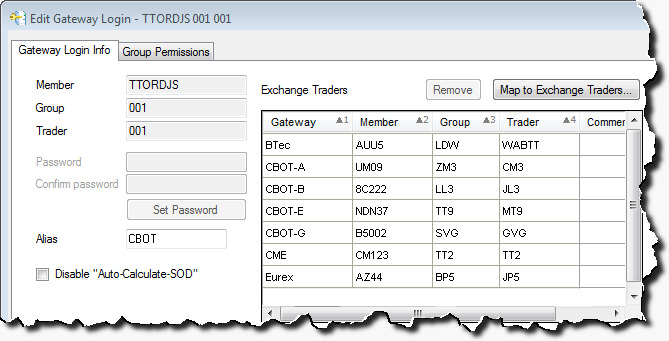 Note: A trader who does not use a TTORD gateway login for Autospreader SE or Synthetic SE can see the working orders of any traders that do use TTORDs for Autospreader SE or Synthetic SE, provided the TTORD is mapped to an exchange trader ID whose Member and Group IDs match the Member and Group IDs of the original trader. From the Users window, select a user that logs into Gateways using a TTORD, and then click Edit. From the Edit User window, select the Gateway Logins tab, select a TTORD gateway login, and then click Edit. From the Gateway Login Info tab, click Map to Exchange Traders. If the Autospreader SE or Synthetic SE Exchange Trader does not exist, click Create to create a new Synthetic SE exchange trader. Otherwise, if the Autospreader SE or Synthetic SE Exchange Trader already exists, move it to the Selected Exchange Traders list and skip to step 6. Select an Autospreader SE or Synthetic SE Market and Gateway, and then enter a unique gateway login created in the To establish an Autospreader SE or Synthetic SE Gateway Login procedure above. The newly created Exchange Trader appears as a Selected Exchange Trader in the Map Exchange Traders window. From the Users window, select a user that does not log into Gateways using a TTORD, and then click Edit. From the Edit User window, select the Gateway Login tab. If the Autospreader SE or Synthetic SE gateway login does not exist, click New. Otherwise, if the Autospreader SE or Synthetic SE gateway login already exists, click Assign Existing Logins, select the gateway login, and then skip to step 5. 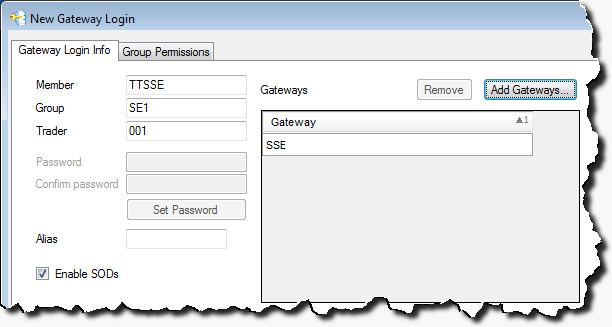 Enter a unique gateway login created in the To establish an Autospreader SE or Synthetic SE Gateway Login procedure above, click Add Gateways, and then select the appropriate Autospreader SE or Synthetic SE server. Because risk is already configured for the Gateway to which Synthetic SE connects, there is no need to set up risk for the Synthetic SE gateway login. The newly created gateway login can be assigned to other traders as needed.